A new matrimonial app promises to match you with a mate filtered by algorithms. QUEEN’S ROAD: Not all marriages are made in heaven. Some are made on social-networking sites and facilitated via dating apps. 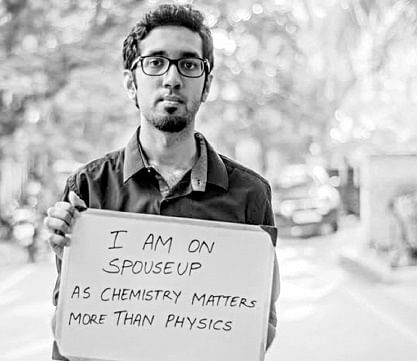 Joining this technologically powered search for lasting love is SpouseUp, a new matrimonial app which also integrates with social networking sites like Facebook. Technology can be a huge game changer in the world of romance and dating as it allows people to transcend geographical barriers and communicate with potential partners from any corner of the world. Communication technology may have evolved to keep up with the times but for many Indian families, what remains unchanged is the conservative mindset about caste and religion. That is where SpouseUp steps in and allows users to find potential partners by using basic filters like age, caste and religion. It even does a horoscope match and checks on the caste and religion requirements. SpouseUp uses state of the art algorithms to match your Facebook likes, shares, interests, etc with that of others. The most popular matches that turn up are of those who are within your friends or mutual friends’ circles, which provides a certain degree of credibility in the choices offered.Using Facebook’s social databases reduces the chance of users coming across impersonators, cyber criminals or fraudsters. He adds, “We are using a standard algorithm to increase the credibility of profiles on social networking sites. We also have a trust meter which takes into consideration the many parameters to overcome fraud which other matrimonial apps would not be able to filter,” adds Karthik. In SpouseUp, one can also play the role of a matchmaker. The app helps provide an opportunity for user’s Facebook friends/family to suggest partners for them. Once the user is successful in finding ‘the one,’ SpouseUp provides a space for the couple to interact. SpouseUp is also working to widen their database by integrating other social networks such as LinkedIn and Twitter to help provide more apt matches for its users. SpouseUp also plans to introduce a unique feature in the app which will allow users to find the right partner within a few kilometer radius of their current location.